>Go to the Browse or Search pages to code documents by checking the reviewers boxes. For example, you can use the 'Multi Doc Edit' function to review/mark one or more documents. If you have a team of reviewers that will be added as users within your account in order to review large set of document, please go to our 'Review Teams', and also learn how to divide the documents to be reviewed. After coding documents, you can use filters to narrow down results to a specific division or document to exclude certain files; this feature also allows you to save and share filters in Lexbe eDiscovery Platform. 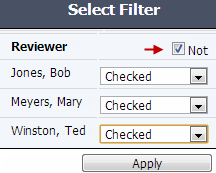 For example, to find documents reviewed by 'Jones, Bob' you will click on 'Select Filter>Select>Dynamic Coding>Reviewer>Bob, Jones', and then apply it. To save and share filters, please go to the 'Filter Quick Links' section. A list of all the filters are automatically saved in the database whenever you click on the ‘Apply’ button in the Filter>Select Filters dialog box from the Browse or Search pages. This action automatically preserves the filter records on the list view under the ‘Recent’ section and creates filter hyperlinks to open specific set of documents. Please note that the default link titles are under the 'Recent Filter YYYY-DD-MM' format, but you can rename them by clicking on the ‘Edit’ hyperlink (e.g., 'Assigned Reviewer = Jones, Bob'). >To show only documents that are unreviewed, from the Browse or Search screens, open Filters>Select Filters>, select all the reviewers (custom tags or usernames) and then click on 'NOT'. This will then show unreviewed documents. -Go to the Browse or Search pages, click on the Filter>Select Filters hyperlink. -Under the Discovery section, select a username to filter on the documents that user reviewed so far. In small cases you can reach the same results by dividing the numbers of pages for review directly from the Browse (Option 1). Below is an example of a small case in Lexbe eDiscovery Platform (2,011 documents), containing 81 pages in the Browse screen with 25 documents. (~81 x 25), so if 4 reviewers each might have around 21 pages (81/4). We also offer Project Management and Technical Services (billable hourly) to help you to identify and organize data sources executing specific requests for document identification. Please contact your sales rep or our Support Center if needed.